Several years ago, while traveling in Japan on business, I had the singular good fortune to be hosted to a day of golf by my honorable hosts. Notice that I said "Day" and not "Round" -- a very important distinction. I know the large majority of my readers are only familiar with golf the American way, but let me recap briefly just to set the stage. You get to the local public course, change your shoes while sitting on the open trunk of your car, hit a few putts and maybe even a small bucket of balls, and off you go. If it's that time of day when you make the turn, maybe you'll grab a hot dog, and wolf it down as you make your way up the 10th fairway. After the round, you'll congregate with your buddies in the clubhouse (or out on the patio), quaff a few beers, settle the day's bets, and that's pretty much it. Maybe you walk, and maybe you ride a cart, but caddies are more of an exception than the rule. 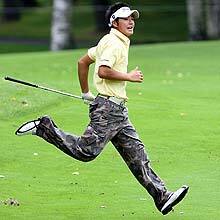 Segue to Japan -- specifically the Kumomoto Country Club, near the Fukuoka Airport on the south island of Kyushu. We arrive at the club a full hour before our tee time in order to have plenty of time to loosen up, and familiarize ourselves with the greens. This particular club has two sets of greens, one for winter, one for summer (I've seen this on a few American courses too -- something about different kinds of grass). As we made our way to the first tee box, I noticed a couple of people wearing coolie-style hats on their hands and knees trimming bushes with scissors. I take another look around at the landscaping by the clubhouse and practice green, and realize there isn't a leaf or a blade of grass that looks out of place. We were then introduced to our caddies. Each foursome shared a caddie, a short woman of indeterminate age ("short", by the way, covers about 90% of the population). The caddy had a riding cart which held all four bags upright in front of her. She stood on a platform, and steered the cart motorcyle-style (steering with handlebars, hand throttle, etc.). I forget her name -- everyone called her "caddy-san", which basically means "Madame Caddy." I'm used to playing in Colorado, where the air is thin and dry, instead of Fukuoka where the air is heavy and humid. So for any given distance, I needed to use at least one extra club. I was using rented clubs instead of my own, which are an inch longer to accomodate my height, so that's another adjustment I needed to make on my club selection. Then I always had to do some higher order math because Japan's golf courses are marked in meters instead of yards -- it's about a 10% adjustment, and it translates into another extra club. All of which is to say it usually took me a few moments to figure out what to hit. Caddy-san watched me make two shots, and after that, by the time I figured out what I wanted, she was always standing there holding out the correct club before I could ask her for it. And despite the fact that Caddy-san also had to supply three other golfers, it seemed like none of us ever had to wait for her, even if we were scattered all over the fairway. All the caddies wore big sunbonnets, and white outfits that looked like nurses' clothes, but baggier. They didn't show any skin except their faces (which were protected by the sunbonnets). They even wore white gloves. The players all walked. I was told they'd be happy to supply me with a cart if I wanted one, but nobody else was riding, and Caddy-san had the bags anyway. And it turns out that there were refreshment huts every three holes. At the refreshment huts (which were very nicely constructed brick buildings, complete with air conditioning and electricity), you could get bottled water, soft drinks, beer (bieru), finger sandwiches, green tea, cold rice, and cold wet towels. It was the cold wet towels I most enjoyed! Despite hitting some spectacularly bad shots into the woods, I never actually lost any balls. Caddy-san was uncanny in her ability to find lost balls. (I guess she knew every tree and shrub). She was also great at reading greens. After we finished playing the front nine, we had a sit-down lunch in the clubhouse. And I'm not talking about a hot dog and potato chips either. They had a full menu of hot and cold dishes (including sushi -- yum!). We had a leisurely lunch, chatting pleasantly about business, the world economy, and Tiger Woods. Then one of my hosts checked his watch and announced our tee time was in 10 minutes. So we had a tee time in the morning for the front nine, reservations for lunch, and a tee time for the second nine in the afternoon. Seems perfectly obvious now, but it never would have occurred to me beforehand. The back nine was much like the front -- gorgeous course, hand-manicured, hustling Caddy-san reading my mind, and the greens, cold wet towels at the refreshment huts... All too soon, the round was over. But rather than sitting around in our sweaty shirts (have I mentioned the humidity? ), we retired to the locker room which has its own hot spring. There we luxuriated in the mineral baths, which were the same temperature as a hot tub, soaking our aches and pains and yips away. Then after a cold shower, and a dry shirt, we were ready for the serious business of post-round drinks and bet settling. By the time we returned to the hotel, it was time for dinner, and sleep. Now that's a "Day" of golf!